She was born in 1933 in Hungary. She has been painting since 1981 and exhibiting since 1982. 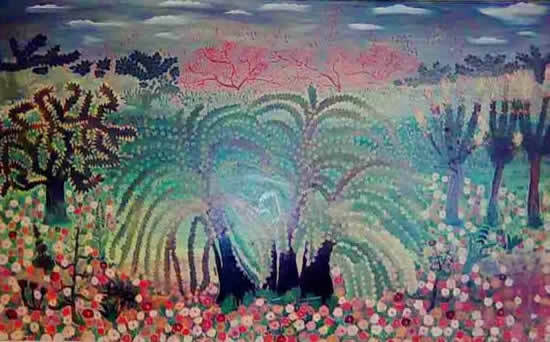 She has recieved several awards and acknowledgment in her own country and abroad , including the Grand Prix of the 8th Naive Art Biennal , organized in June 1997 at the Naive Art Museum in Jagodina. Most of her paintings offer snippets of peasant life. Her pictures are cheerful with figures surround by a myriad of flowers. Preferences: Dr. Bánszky Pál : The wild flowers of fine art 1997. She has the presented painting in the collection of the gallery.